Week 10 ended with a great defensive performance from the Houston Texans, thats right the Texans were able to hang on and beat the previously undefeated Cincinnati Bengals 10-6. It was an impressive defensive performance to cap off the week. Houston simply had players step up at the right times and make big stops. Cincinnati's defense played great, but their offense struggled, which is unsurprising since the Bengals never play well on primetime TV and Dalton doesn't play well against the Texans. It was the perfect storm for the Bengals to lose their first game of the season. This week's villain is in general just a bad guy, whether on or off the football field. The Cowboys took on the Buccaneers in what should of been a win finally for Dallas after 6 straight losses. The defense played well, but some of it's supposed biggest stars flamed out. Week 10's Villain is Greg Hardy because at the cost of $7800 I expect to get a big of production out of you. Instead, Hardy was able to muster up only 2 fantasy points. 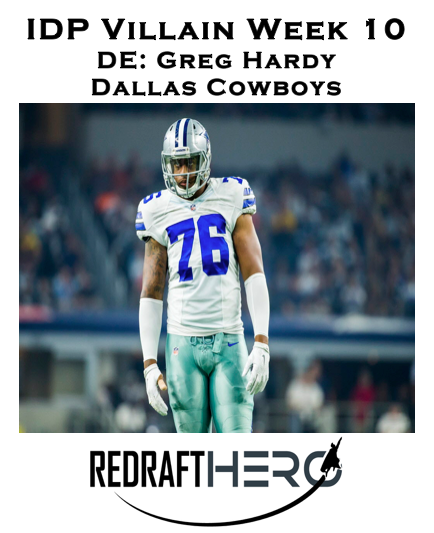 Now I know, Hardy has made headlines for a lot of his off the field actions, but the Cowboys signed him because he is a force on the football field. This past weekend he did nothing to show that against one of the weaker offensive lines in the league. When it comes to Hardy many things can be said, most of them are not positive. My guess is the Cowboys may get a little stricter with him after this performance since it was revealed only hours after the game that Hardy had been late to practices and missing meetings ever since he returned. If he doesn't care about putting in the work then he isn't just a bad person, he is a bad teammate and deserves to be this week's villain for many reasons. This week's hero is a guy that isn't normally the person you think of when you picture a defensive hero. In fact, only a few weeks ago he was benched because of his poor play so it's nice to see him doing well. The Jacksonville defense has been middle of the road this year and their defensive backs have had a hard time making big plays. This weekend against the Ravens though one DB stepped up and finally made a takeaway, not once, but twice. 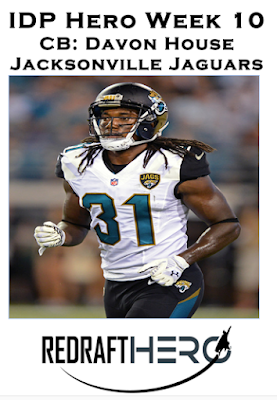 Davon House is this weeks IDP Hero after making two big interceptions against Baltimore this weekend and help the Jaguars come away with the 22-20 win. House was a steal this weekend costing you only $4500, that's the bare minimum in Redraft's salary structure. If you were one of the lucky one's Davon ended up getting you 15.5 fantasy points, not to shabby for a guy, like I said was benched October 25th. While I don't expect House to become a top CB in the league, he definitely played like one this weekend when his team needed him the most. Come back later in the week to check out Week 11's IDP Best Buys and if you haven't go to Redraft Hero and check out their daily fantasy sports contests. I promise you won't be dissapointed.